I lived on this beautiful road in Waterbury for 3 years. During those years I can’t tell you how many times I walked up and down that road. There were wooded trails behind my house which were great for snowshoeing in the winter, hiking and mountain biking in the summer. And I took full advantage no matter what the season. During my 3 years there, I never once met my neighbors. Not one. Ever. I didn’t have a dog then. It’s different when you have dogs. I have now lived in my new house for 4 months and have already met 3 of my neighbors and countless other dog owners out walking their dogs on the trails behind my house. My point is, dogs bring people together. 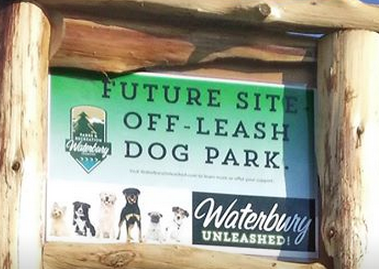 My little town is trying to build a dog park in Waterbury, VT and we’re having a tough time raising money for it. Perhaps it’s because not many people know about it. Perhaps, people aren’t thinking of a dog park in the middle of winter, or perhaps people just aren’t sure how it would truly benefit the community. As a dog owner, a homeowner and an active person who loves the outdoors, I feel strongly that it no only benefits local dogs and their owners, but it really does help bring a community together. I mean think about it. When you’re out on the trails without a dog, you might pass someone and say hello and keep walking. But when you have a dog 9 times out of 10, you stop, let the dogs play and have a conversation. You meet someone new, that you might not have met any other way. Wouldn’t it just be nice to have a designated place for this to happen? Dog owners travel with their dogs. I know when I’m booking a vacation around New England I first find out where the dog friendly hotels and towns are as that determines where I’ll be going. Travelers who might not have stopped in Waterbury otherwise might actually stop, let their dogs play in a safe environment and spend some money at local businesses having lunch, spending the night, shopping, etc. Local businesses would benefit from a dog park and a dog-friendly community. Dogs love to run. And though my little boy Bloo is only 50 pounds, that dog can run like the dickens. I can’t possibly keep up with him or give him the exercise he needs simply by walking him around town on a leash. He’s a 4-legged beast who needs his exercise. A dog park offers a safe place for dogs to run. It’s safe for the dogs because it’s fenced in and it’s safe for the community because there will be less dogs running free on the trails and in the parks. I know money is tight. I know it’s the middle of winter and I know how much heat costs. But I also know spring is on its way. And pretty soon the trees will be budding, the days will be long and sunny and we’ll all be wishing we had a dog park to bring our dogs to. Help be a part of building a community and making it stronger. Don’t leave it for someone else to do. Help us pave the way and build a dog park. Donate today! Categories: Dog Tales, Travel Dog | Tags: dog park, dog park waterbury, dog parks in Vermont | Permalink. I'm an active blogger, freelance writer, content marketer and SEO strategist. I love cycling, snowboarding and spending time with my rescue dog, Bloo.